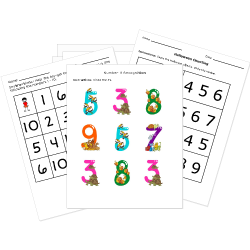 These counting worksheets include activities from number coloring pages for building number recognition to number charts up to 1,000 for developing student understanding of the count sequence. Worksheets labeled with are Common Core Standards aligned and accessible to Pro subscribers only. Become a Subscriber to all standards aligned worksheets. Don't see a printable you need? Use our Test Maker™ to create your own printable that fits your needs. Browse counting and comparing numbers questions or use our advanced search to find existing questions while filtering by grade levels and keywords. Related Lessons: Counting to Ten and How Many?